Fandango Awards Watch Giveaway Wants You To Catch This Year's Best - Are You Screening? Movie award season is still in full swing, even if we’re pretty much down to the Academy Awards, and I’ve got a giveaway for you. 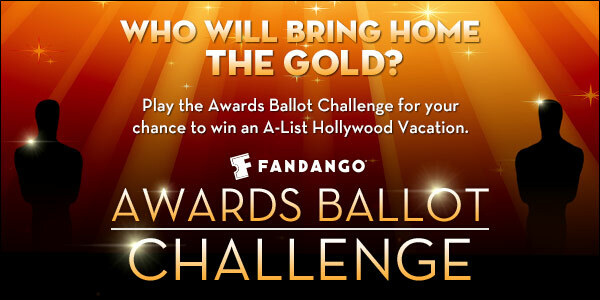 It’s a giveaway to get you to the movies, and the best part is that Fandango has even more in store for you with their Awards Ballot Challenge. It’s been a pretty crazy year for movies, and the awards we’ve seen handed out so far have caused the usual stir. From ineligibles to snubs, there’s been a lot to talk about, and with the division of winners looking over various guild awards, the Golden Globes, the CCMAs, and more, there aren’t a lot of sure bets this season. Our friends over at Fandango not only have a very cool challenge for you, but they also have a one-stop shop for everything related to the upcoming awards, and award season in general. Make sure you check it all out by following the links below. Plus, to help celebrate award season in general, and to help make sure you get a chance to catch all of the contenders you can, we have a giveaway for you right here. We’ve got a $25 Fandango Gift Card up for grabs. Finally, make sure you check out our picks for the best and worst of the year.